If you are interested in getting a job the Supported Employment service can help you. This service gives people with a disability the help they need to find a job and then learn how to do it well. 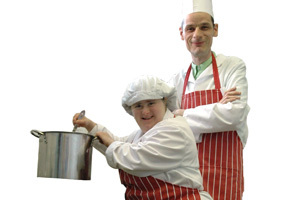 The first thing the Supported Employment Service does is get to know people. They find out what people are good at, what they enjoy doing, and what help they might need at work. They can set up job tasters and short placements so people can try out jobs and decide what they want to do. They talk to employers to try to find a job that matches the person's skills. When the person starts work, the service helps them to settle into the work place and teaches them how to do the job. They help the person get to a standard that is good enough for the employer. After that, they check that things are going OK and make sure the person and their employer are both happy. They can also help people to get Open College qualifications that prove they can do their jobs well. The Supported Employment service is run by 'Bootstrap'. You can contact Bootstrap on (01254) 680367 if you want to find out more about Supported Employment.